Lifelike Portrait is a sonic project that sprung out from a multiculturally cultivated route of producer George Vasilas within a 3-year course of living in London. The musical imagery of Lifelike Portrait’s aesthetic is based on the combination of sequencing techniques and electro-acoustic instruments bound together by the female lead vocals. It’s difficult to fully explain it with words so check out Lifelike Portrait’s music and videos in social media. 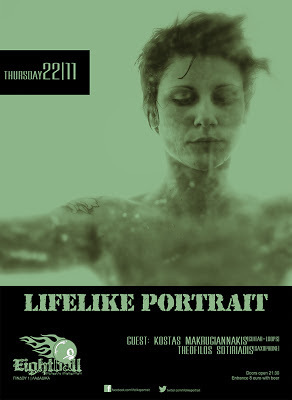 Lifelike Portrait’s entire concept is expressed through 11 tracks soon to be released. Αναρτήθηκε από Τάσος ΕΖ στις 3:59 μ.μ.